The Concord Police Department will be conducting two specialized Motorcycle Safety Enforcement Operations on Tuesday, September 27, 2016, and Thursday, September 29, 2016, from 5:00 p.m. to 9:00 p.m., in an effort to lower deaths and injuries associated with motorcycle collisions, according to the Concord Police Department. Extra officers will be on duty patrolling areas frequented by motorcyclists and where motorcycle crashes occur. Officers will be looking for violations made by drivers and riders alike that can lead to motorcycle crashes. They will be cracking down on both those operating regular vehicles and those operating motorcycles who are violating traffic safety laws. Ted Antenucci, long time CEO of Catellus Development Corporation, seems to be a man at peace with himself. Picking over a Chinese Chicken Salad while at lunch with me August 12 in Aurora Colorado, the celebrated developer defended his decision to accept a token $250,000 fee in May of this year from the City of Concord to withdraw his company for consideration to become master developer for the $3 billion Concord Naval Weapons Station (CNWS) Reuse Project. Pleasant Hill Police are chasing a grab & run suspect in the area of Stimel Dr., off Hookston Rd. near the Concord border. The suspect is jumping through backyards, according to police. In California, it’s now legal to smash a vehicle’s window to save an animal who is in danger of dying during the extreme heat. The rescuer can break the window without fear of prosecution if there is no other way to save the dog, and law enforcement isn’t arriving fast enough. Question: Would you hesitate to break a vehicle’s window if you saw an animal in distress? 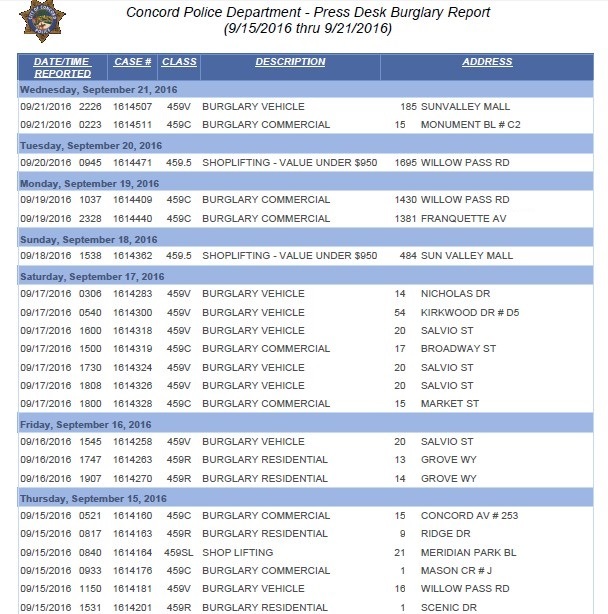 Concord had 22 burglaries between Sept.15 – Sept.21. The week before, Concord had 16, and before that, Concord had 15 burglaries. 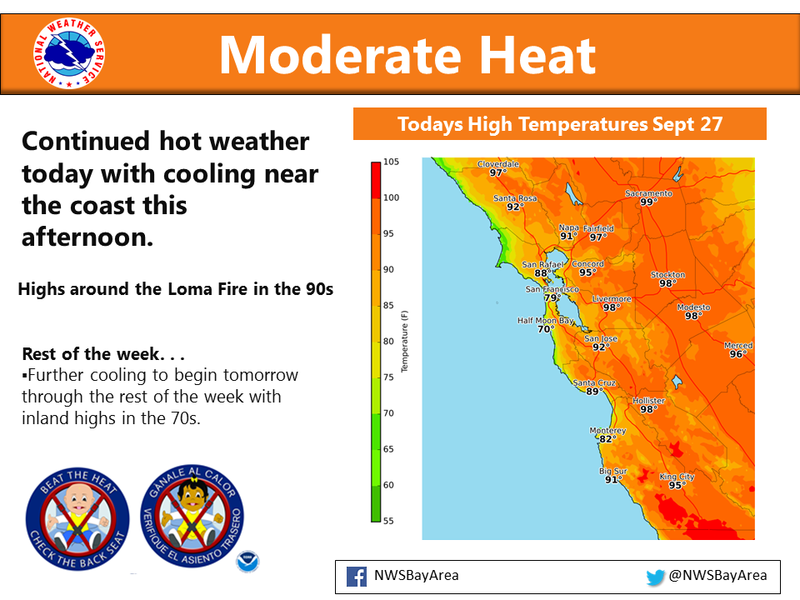 The Bay Area’s heat advisory is no longer in effect, but you can expect continued hot weather today with cooling near the coast this afternoon, according to the National Weather Service. A more noted cooling trend will begin tomorrow as a pacific trough approaches the region bringing near to below normal temperatures Friday and Saturday, the Weather Service said. Do not leave children or pets in a car….beat the heat, check the backseat! Governor Jerry Brown signed a bill today that will require California law enforcement officers to lock away their handguns when left in an unattended vehicle, state officials announced. Senate Bill 869 was introduced by Senator Jerry Hill (D-San Mateo and Santa Clara counties) back in January. The bill will update an already existing state law, which requires civilians who leave their handguns in their car to store them securely in a lockbox attached to the vehicle or the vehicle’s trunk, and out of plain view. Law enforcement officers had previously been exempt from the requirement, Hill’s office said. A violation of the requirement will be met with a fine of up to $1,000, Hill’s office said. The bill however would exempt peace officers carrying out official duties during circumstances that require immediate aid or action. Handguns being shipped legally though a carrier such as FedEx or UPS will also be exempt, according to Hill’s office. A number of recent incidents involving handguns stolen from law enforcement vehicles and then used to commit crimes have occurred in the Bay Area. San Francisco resident Kate Steinle, 32, was fatally shot in July 2015 when a homeless man shot a gun near Pier 14. The gun was later confirmed to have been stolen from an off-duty federal agent who left it in a parked car. In August 2015, guns were also stolen from the vehicle of a Hayward police officer in Oakland, as well as from the vehicle of the University of California at Berkeley’s police chief while she was jogging. Then in September 2015, Emeryville resident Antonio Ramos, 27, was fatally shot as he was working on a mural in Oakland. The gun used in the shooting had been stolen from a U.S. Immigration and Customs Enforcement agent in an auto burglary in San Francisco earlier that month. Additionally, two fatal shootings in October committed during robberies in San Francisco and Marin County by a trio of drifters were linked to a gun stolen from a vehicle in San Francisco just days earlier. Also, in February, a U.S. Immigrations and Customs Enforcement agent reported losing his pistol in San Francisco. Both San Francisco and Oakland have put similar laws into effect earlier this year, requiring firearms to be locked in a lockbox or trunk of a vehicle. Hill said while the passing of SB 869 is a victory for gun safety, he plans on working on legislation that would help law enforcement agencies keep track of guns that are lost or stolen. “Building on SB 869, I plan on introducing legislation next year to tighten up these practices so that every enforcement agency is required to have a process in place to account for all the weapons they own or use,” Hill said. SB 869 will take effect on Jan. 1, 2017, according to Hill’s office. 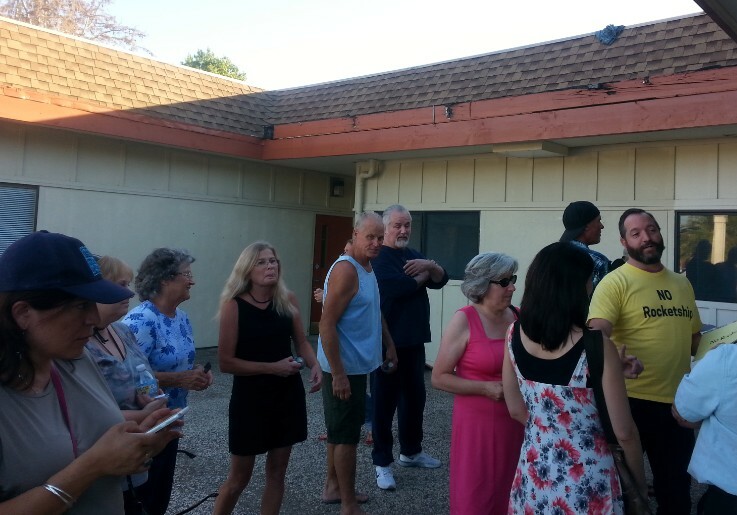 Concord Police were called on citizens who tried to attend a public meeting on the proposed Rocketship Charter school at 988 Oak Grove Rd., which is currently the site of “The Church At Concord”. All homes within 500 feet of the church property received a notice from Rocketship Charter regarding a meeting tonight. Those on scene say only about eight homes were given a notice, and anybody who lives more than 500 feet from the property was denied entry into the meeting. Concerned community members waited outside and were told not to take pictures or video, according to witnesses. 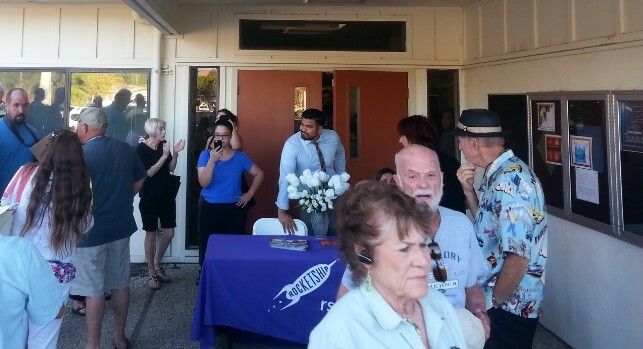 Rocketship Charter finally said the public would be welcome after 7 p.m., but most people had already left after police arrived, witnesses said. Rocketship Charter currently has a school on the campus of Ayers Elementary school in Concord. The school was denied by the Mt. Diablo Unified School District and the County Board of Education, however, it was approved by the California Board of Education. The MDUSD, under proposition 39, is required to provide the charter a facility in which to operate, even though they are against the proposed school. Thanks to “DLS” for the photos from outside the meeting. UPDATE, 8 p.m.: The public has been invited in. About 30 people from the surrounding neighborhood are attending the meeting. Rocketship Charter says the proposed school, which is right down the street from Ygnacio Valley Elementary on Chalomar Rd., would hold about 550 students. Traffic and safety are also major concerns since the school would be on the corner of Oak Grove and Chalomar. The Bay Area’s intense heat wave prompted regional air quality officials today to issue another Spare the Air smog alert for Tuesday. It’s the third consecutive day of smog alerts from the Bay Area Air Quality Management District. People are encouraged to carpool, bike, walk or take public transportation to work and school instead of driving alone. Also, people should exercise outdoors only during the early morning hours when smog concentrations are lowest. There is no wood-burning ban in place and no free public transportation trips are being offered. This is the 25th time this season that the air district has issued a Spare the Air alert, tying a record set in 1996, according to air district officials. Governor Jerry Brown signed into law Saturday AB 1719, a law that requires hands-on cardiopulmonary resuscitation (CPR) instruction, along with Automated External Defibrillator awareness in high school health classes, an American Heart Association spokeswoman said. California is the 35th state to provide CPR training in schools, along with Washington, D.C., spokeswoman Robin Swanson said. State Assemblyman Freddie Rodriguez (D-Pomona) authored the bill. “As an Emergency Medical Technician for over 30 years, I know that CPR is one of the most important life skills a person can have,” Rodriguez said in a statement. “By teaching CPR in high school, we are sending students into the world with essential, life-saving skills,” Rodgriguez said. High schools will begin to teach CPR in health classes in the 2018-2019 school year, Swanson said, in a lesson that takes 30 minutes. “I am so glad I learned CPR at a young age because it helped save my friend’s life,” 13-year-old American Heart Association volunteer Skylar Berry said in a statement. “We should all be prepared to act in the case of an emergency and I’m happy other students will now get the chance to learn CPR,” Skylar said. Skylar used her CPR training to save a friend from drowning in a swimming pool when she was 11, Swanson said. Many others have died because no one near them could administer CPR. “If someone had been near my daughter at the time of her collapse had known how to conduct CPR, her life could have been saved,” AB 1719 advocate Debbie Wilson said in a statement. “I want all students to have a chance to learn this life-saving skill so other families don’t suffer the same heartbreak that ours did,” Wilson said. Every year, more than 350,000 people suffer from sudden cardiac arrest outside of a hospital, and less than one-third receives CPR from a bystander, Swanson said. CPR and defibrillation can more than double the chance of survival. “So many lives have been saved because of the heroic act of bystanders who performed CPR. On the other hand, there are just as many stories of people who did not make it because no one nearby took action,” cardiothoracic surgeon Kathy Magliato said in a statement. “With CPR in schools, we have the opportunity to create a generation in which teens and young adults in California [are] trained in CPR as part of their health education and prepared to save lives. AB 1719 will add thousands of qualified lifesavers to our state,” Magliato said. A Claycordian who calls herself “Disgusted in Concord” is sick of seeing dogs in the mall, especially when they fight. In addition to shopping, I also walk at Sun Valley Mall for exercise. During the recent past, I have noticed small dogs either being carried or in a baby stroller on Sundays. This last Sunday, a couple was walking their Alaskan Husky on a long leash along with a smaller dog. This was on the lower level at the JC Penney’s end. As they were walking toward the center court, a customer was walking his black lab. As these two dogs passed, a small fight between the dog’s ensued. Neither of these 3 animals had any markings that they were service dogs. Needless to say, there was NO security present to aid the other customers. What is the policy of Sun Valley Mall in reference to dogs in the mall? Pets/animals, with the exception of service animals such as Leader Dogs, are prohibited, according to the Sunvalley Mall. Do you plan to watch tonight’s presidential debate? A mountain lion was spotted near downtown Clayton, according to a concerned citizen. Shauna with her principal from Valley View Middle, Lisa Sullivan, on her right side and MDUSD Superintendent Dr. Nellie Meyer on her left side. Shauna Hawes, one of the Mt. 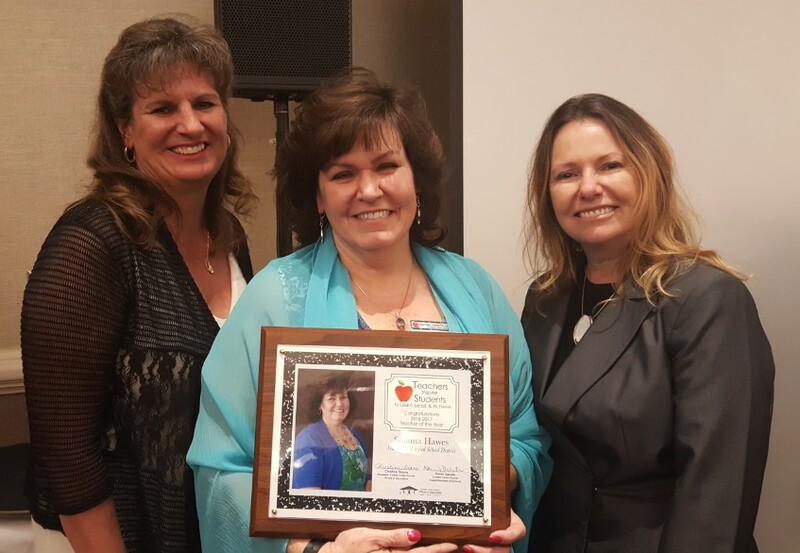 Diablo Unified School District’s Teachers of the Year, has been named a Contra Costa County Teacher of the Year. Hawes teaches computer applications/ technology to grades 6-8 at Valley View Middle School in Pleasant Hill. She has been with Mt. Diablo Unified her entire 18-year teaching career. We asked her to answer a few questions about her career and about what makes magic in the classroom. Concord Police Officers can expect to one day be wearing body cameras, it just hasn’t been determined when that day will be, according to Concord Police Chief Guy Swanger. “I have staff researching body cameras and we have a committee looking at all parts of this program, I believe it is inevitable that public employees, particularly police, will be using devices that record contacts.” Swanger said. Swanger says capturing the public on recording, sometimes in their most private and revealing moments (crime victims, car crashes, etc), has to be handled delicately, and many questions still exist about when it’s okay to release the video to the public. It has also not been determined by the legislature or courts whether the video is considered ‘public’, according to Chief Swanger. The cost of the cameras hasn’t been determined at this time, but Swanger said the first purchase would obviously have to be large. There will also be costs that include replacement, storage, service, and resources necessary to retrieve video. Swanger says he plans to get feedback on the issue from Officers, other employees and the public in the near future. A Spare the Air Alert is in effect Monday, September 26, for the San Francisco Bay Area. Concentrations of ground-level ozone pollution are forecast to be unhealthy. High levels of ozone pollution are harmful to breathe, especially for young children, seniors and those with respiratory and heart conditions. Exhaust from vehicles on Bay Area roads accounts for more than half of the air pollution in the region. Bay Area residents are asked to drive less to reduce smog and improve air quality in the region. Residents are also encouraged to consider an all-electric vehicle as their next vehicle purchase to help reduce the amount of gas powered vehicles that contribute to unhealthy smog. Change your daily commute by carpooling, vanpooling, taking transit, biking or walking instead of driving alone. Doing this will help reduce pollution levels and health concerns when temperatures are high. To learn how to change your commute online, visit 511.org. To find out how your company could help you save money on your commute by offering commuter benefits, visit commuterbenefits.511.org. This AirAlert is provided by the Bay Area Air Quality Management District. Thank you for doing your part to Spare the Air! Critical shortages of fully-credentialed Special Education teachers are a well-documented national problem, with data showing that the number of Special Education credentials issued in California decreasing 21% from 2011 to 2013. As the demand for Special Education professionals increases, the consequence of this teacher shortage creates challenges for school districts across the country. To respond to the need for qualified Special Education teachers, St. Mary’s College of California (SMC) Kalmanovitz School of Education has created an innovative, reciprocal partnership with the Mt. Diablo Unified School District (MDUSD). Under the program, MDUSD employees currently serving as Special Education assistants in the classrooms or serving individual students as one-to-one assistants, are enrolled in a two-year program with extensive and intensive coaching and classroom support that helps them earn an intern credential for Mild/Moderate Special Education that deems them to be highly qualified Special Education teachers. The program was co-designed by Drs. David Kraft and Peter Alter, co-directors of the Education Specialist program at SMC; Dr. Wendi Aghily, MDUSD Director of Special Education; and Leyla Benson, MDUSD Director of Personnel. “This partnership will allow us to strengthen the preparation education specialists receive so they can enter the classroom with confidence that they can fully address both academic areas, and other domains, such as communication and social/behavioral issues,” said Dr. Alter. The initiative includes three components that set it apart from traditional teacher preparation programs. 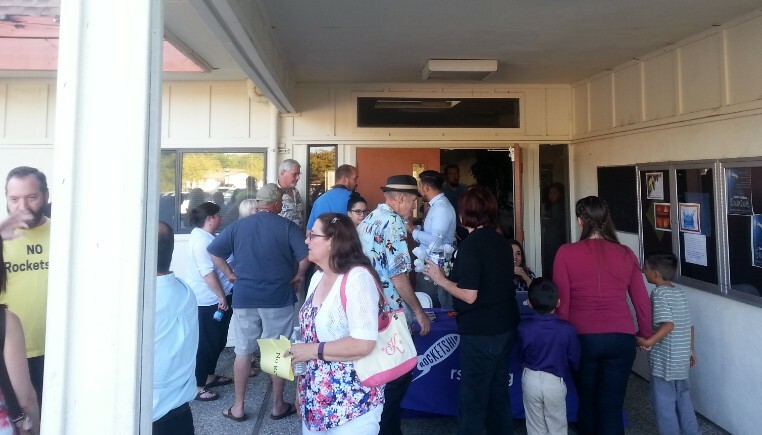 All classes are being held at MDUSD facilities to decrease travel time and increase convenience for the candidates. By pooling resources, MDUSD and SMC are able to provide an increased amount of ‘in the classroom’ support and coaching. In the first year of the program, a group of district-funded coaches provide ongoing feedback, demonstration lessons, classroom resources, and support with classroom management. In the second year, candidates are moved to an intern credential that deems them to be highly qualified Special Education teachers. During this intern phase, MDUSD and SMC have developed a formal plan of support provided by support personnel by both the District and the college. It is estimated that each candidate will be provided over 100 hours of support over the academic year. The program of study has been modified so that courses typically taught in multiple semesters have been condensed to allow multiple courses to be taught within each semester. Additionally, the program has been extended from 18 months to two years. Collectively, the modifications allow teacher candidates to attend classes for two evenings each week, allowing for a home/work/school balance. In the inaugural year of the program, 12 individuals began the course of study. By this time next year, all candidates will be eligible to become the teacher of record in their classroom. In two years, they will have completed their coursework and will be able to fill the need for education specialists within the District, and begin a new journey on their career path. “We see some tremendous talent among our Special Education assistants, and with a program such as this which provides reduced tuition and loan forgiveness, it’s an opportunity we hope they can’t turn down,” said MDUSD’s Leyla Benson. 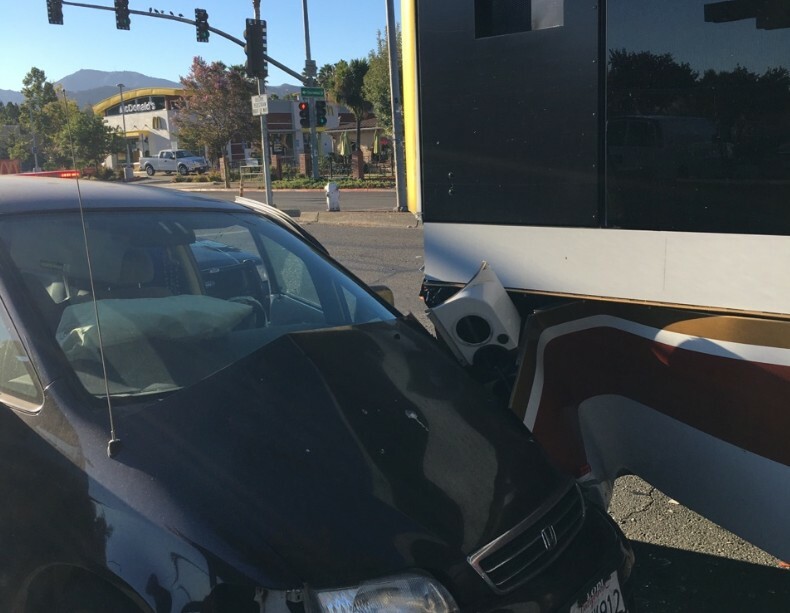 A possible red light runner rear-ended a County Connection bus on Clayton Rd. near Thronwood Dr. on Sunday morning, according to the Concord Police Department. Police tell Claycord.com the woman allegedly ran the red light on westbound Clayton Rd. and apparently tried to swerve out of the way of a vehicle turning left on to Thornwood Dr. from eastbound Clayton Rd. 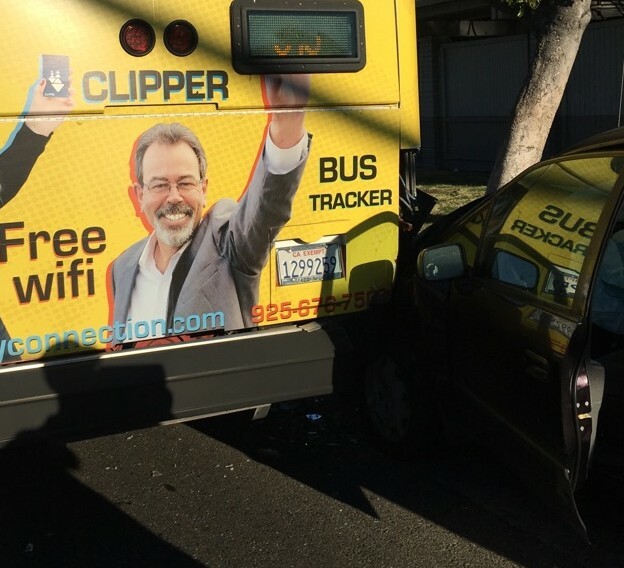 After she swerved, she struck the back of the bus. 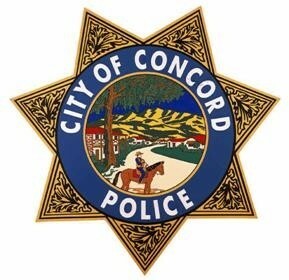 Concord Police are investigating a reported shooting in the area near the Skate Park off Cowell Rd. The suspect vehicle was last seen on Mesa, behind the Concord Police Department. A vehicle was hit with gunfire. It’s unclear if anyone was injured. 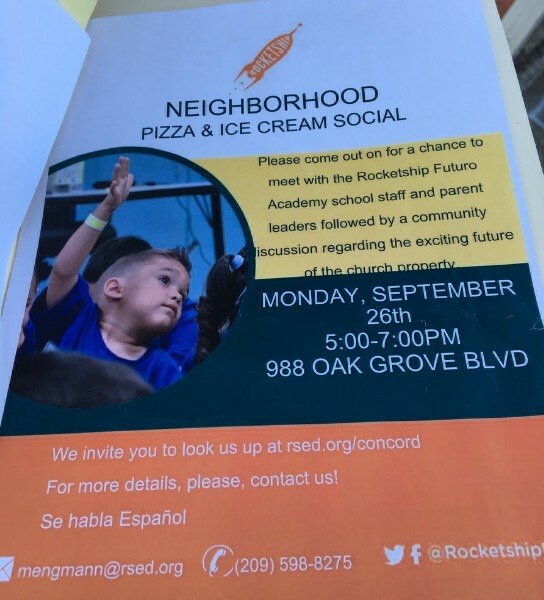 CLAYCORD.com on UPDATE: Rocketship Charter Calls Police on Neighbors Trying to Attend Public MeetingClaycord takes no sides. We report what happened. The flyer says "community meeting", not " invitation only". Aspirin on Claycord – Talk About PoliticsThis election is ugly. This is the future if Trump is elected. It's Official on Claycord – Talk About PoliticsTrump won the debate last night. Michael Moore said so. Aspirin on Claycord – Talk About PoliticsDick Cheney and the KKK and the NRA are for Trump. Those are the kind of people I would not want endorsing me for office. Aspirin on Claycord – Talk About PoliticsConfirmed: Trump is not fit for president. Aspirin on Claycord – Talk About PoliticsRepublicans don't learn. They elected GW Bush twice. Frustrated on Claycord – Talk About WhateverJust saw #52.... What did suspect do? John Pope on Bay Area Heat Advisory No Longer in EffectSaw a big fog bank from the Colma BART station. Lookin' good for Weds./Thurs. 80's are just right! 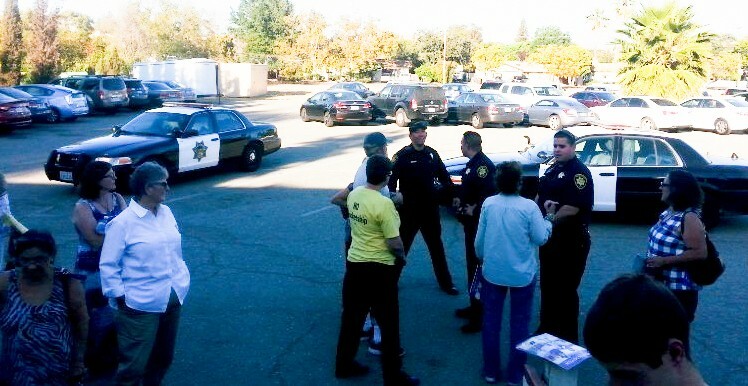 Frustrated on Claycord – Talk About WhateverAny idea what all the police activity was on Pringle Ave Walnut Creek today? Wowza on Claycord – Talk About PoliticsBill and Hillary. Bilary Don't give the country Bilary! Kelly on Claycord – Talk About PoliticsAfter that horrible debate yesterday, I'm still a Republican. Think McFly on Pleasant Hill Police Chasing Grab & Run Suspect on Stimel Dr., Off HookstonMost cops after a few years on the force are in no shape to run more than about 75 yards. Atticus Thraxx on Governor Signs Bill Requiring Officers to Lock Away Guns Left in VehiclesAn unattended vehicle is not a secure place to store a firearm. Atticus Thraxx on Bitterness Still Remains on Selection Process that Made Lennar-Five Point Developer for CNWS Reuse ProjectWhat the hell is Chinese Chicken Salad?